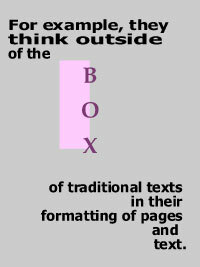 Authors emphasize their arguments through the use of bold print. Words are also not restrained within margins; emphasis is given in bold. The visual just isn't an image; it is a way of reading and rethinking. However, new media is not just about formatting or incorporating sound and images. In "Opening New Media to Writing: Opening and Justifications", Anne Wysocki discusses how Writing New Media is offer[ing] "some openings--some ranges in of active possibilities--we each see in this particular time of change, openings that allow and encourage us to shift what we do in our thinking and classes, so that we make actively present in our practices, how writing is continually changing material activity that shapes just who we can be and what we can do" (3). She also addresses the need for the definition of new media to go beyond text, sound, and images incorporated in a text just because it can be done; "I am trying to get at a definition that encourages us to stay alert to how and why we make these combinations" (19). It is a new way of seeing things and working within realms that are more comfortable for students to engage their learning. and Johnson-Eilola's "The Database and the Essay: Understanding Composition as Articulation" about exploring databases and search engines to look at a different type of composition not traditionally considered by teachers of writing as texts and only seeing them as "computer programming and software engineering" (218).